School­s to revert to 2002 syllab­us in April 2015 as PTI govt accept­s demand. PESHAWAR: The Pakistan Tehreek-e-Insaf-led (PTI) government in Khyber-Pakhtunkhwa has agreed to revisions in the curriculum for government schools here – including the removal of pictures of schoolgirls with their heads uncovered – for the new academic session commencing April 1, 2015. The PTI’s coalition partner Jamaat-e-Islami (JI) raised objections over the curriculum which was approved in 2006. The JI said Islamic chapters had been removed in 2006 syllabus; the party also wanted secular chapters removed from the textbooks. 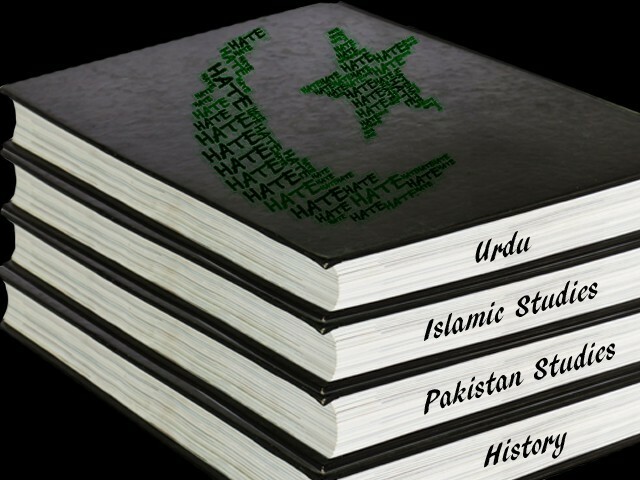 The religious party asked for the removal of “objectionable” materials and the addition of 18 Quranic verses to grade 9 Chemistry book and “Assalam-o-Alaikum” instead of “Good Morning” being taught in first graders’ textbooks. The JI expressed reservations over images in the Science textbooks for grade 4 and demanded the exclusion of chapters on Raja Dahir and Ranjit Singh in Pakistan Studies grade 8. As per the revised curriculum earlier, verses on jihad were removed from the ninth-grade Islamiat textbook and added to the grade 11 course. According to Directorate of Curricula and Teacher Education (DCTE) Director Bashir Hussain Shah, the provincial government has accepted all of JI’s demands. The education department has notified all public sector institutes to revert to the curriculum set in 2002. The government managed to convince JI leaders to leave chapters on Bacha Khan and other Pukhtun personalities in the syllabus. Earlier this month, Minister for Higher Education Mushtaq Ghani told a delegation of Peshawar Textbook Board that all objectionable material had been eliminated from textbooks. He added that ‘objectionable material’ was included in books in 2006-2007, but the PTI government took notice and after long consultations with alliance parties and educations experts, it had decided to remove such material. “From the next academic session new books will be taught in our province’s schools which will not have any objectionable material,” said Ghani. He added 4.5 million new books need to be printed and the government was trying to get that done as soon as possible. In 2006, the federal government wanted to remove duplication from various primary and secondary level textbooks and therefore the syllabus for all government schools was changed. However, the then MMA government in K-P condemned the centre’s decision. It formed a committee comprising leaders of various political parties and asked the federal government to refrain from making these changes; some of its demands were accepted. In 2010, the 18th Amendment brought education under the province’s control and the ANP-led government of the time made some more changes to the syllabus. Provincial ameer says matter will be taken to national and provincial assemblies. If Imran is fair and honest to kids of KP, he should provide them same books and syllabus which his sons are studying. Those who still believe him that he would give them Naya Pakistan, they should get some advice from a brain specialist. A glimpse of the naya Pakistan. Lol! Is the province being run by PTI or JI? Where is your resistant and belligerent attitude PTI when you are being dictated? Is this what we should expect when you come to the power in the center? What a let down! Soon we’re going to be back in the middle ages :D oops already are. So is this Naya Pakistan? Clueless, scientifically illiterate, morally bankrupt and intellectually challenged people should not get to decide things that affect the happiness and well being of others.. I feel pity for people of kpk but again- they asked for it. Where are pti specialists? Can they enlighten us on this GREAT education Reform.Is this what your idea of building nation. And the murder of Pakistani history in textbooks takes a new turn. Why are we in constant denial that we have to rewrite history? No one objected to when ANP brought such illogical things in the Text books. Now suddenly everyone wakes up. I didnt get any thing what was the objection able material that was removed ? JI is taking Pakistan backwards. speculating without knowing the details of exactly what has been removed and why is not the right approach. There is a lot of obscenity and western culture is being promoted these days in schools. So whats wrong with including quranic versus or saying assalam alaikum? u guys never object when these kids watch katrina kaifs vulgar dances or vulgar cartoons r included as part of the curriculum. being modern does not in any way mean getting westernise..this is the misconception and inferiority complex most pakistanis have. they consider their heritage and culture a shame..
Alhamdulillah a positive move. As a scientist and Muslim, there is no contradiction between the two, so people need to wake up and have confidence in our deen, and not sell their cultural heritage out whilst excelling in all secular subjects too. Your definition of “fairness” is absolutely flawed. IK’s children live in UK by virtue of their mother’s residence and studying UK syllabus. KP’s kids should read up to date Pakistan syllabus. Stop making these backward points. As far as i know, IK has pretty much delivered on his promise and in KPK children of laborer are also reading the same books as are the children of elite. This i guess non of u anti Islam liberals has noticed. Rest what changes JI is doing in books should be dealt on merit. Anti Islamic sycophants need to hold their jumping to favorite topic of Islamic history bashing… Guess u guys do enjoy the highly biased dramas and movies of India showing below imagination de-characterisation of ppl like Shahabuddin Ghauri etc. and have taken that as ur true history. Yes, Naya Pakistan! Armchair warriors don’t know the ground reality! Change is gradual. I believe it was a fair enough demand from JI. I am glad PTI acknowledged it. No one in KPK needs your pity, KPK is doing much better than previous years; better policing, better law n order, better transparency and lesser corruption, improving health and education facilities. Spare your pity for the whole country suffering from worst inflation, increased load shedding (at an elevated tariff), worst corruption (comparable to the last government), miserable meritocracy and bla bla bla. And the worst part is no one asked for it. History is an event of the past, shall we tell our children that non-Muslims never ever lived on our ,oh so pure motherland, again a form of ethnic cleansing. Let us keep religion out of the classroom altogether, Let the parents provide it through other means. Keep the adulterated religion out of school and out of the textbook. Build schools where all ethnicities can attend as equals. In other words, they don’t want to teach actual science and history, instead they want to continue to brainwash and indoctrinate impressionable children…Perhaps, the Govt. of Pakistan can divide the schools in KP into 2 categories .. Fiction and Non Fiction… and parents can then choose where to send their kids…Clueless, scientifically illiterate, morally bankrupt and intellectually challenged people should not get to decide things that affect the happiness and well being of others..
Could you please let me know the school which shows Katrina Kaif videos as part of curriculum???? @ animal farm…can’t u see that 100% of our channels r competing against each other to show indian ads, models, stage shows, dances shows, all of which have indian girls half naked and in short skirts showing some revealing dances..katrina kaif was just an example to point out the menace surrounding us…almost 90% of the cartoons dubbed in ‘hindi’ or english and meant for very young kids r openly showing vulgar scenes and have objectionable language..I have witnessed it myself. the whole society is being systematically brain washed and pushed into the filth yet people like u want to stay silent and even encourage and promote such traits and values in a muslim culture..isn’t all this against the ideology of Pakistan as envisioned by founder of the nation?? Why don’t u stand up for a ban on all the Indian crap which is destroying our values, culture and language?? For those with not enough grey matter in their skulls, its a cultural invasion by India which is far more detrimental to our society..
U r talking about channels…But I’m asking which school shows these channels?? ?